Since the publication of the Makovsky survey, robo-advisor assets under management (AUM) has grown considerably. For those unaware, robo-advisors are an emerging sector in wealth management that package Individual Retirement Accounts (IRAs), cash management and even some financial planning within a simple application, often on mobile devices. Many of these services offer relatively sophisticated plays like tax-loss harvesting, and considering the infancy of the industry, LP commitments or smart beta strategies do not seem like stretches for application access at all. Robo-advisors offer discounted access to wealth management often by using mean-variance portfolio optimization on Exchange Traded Funds (ETF), other large funds or individual share ownership. Many clients of the services are millennials who have been raised alongside automated services and prefer an offer from a fresh face rather than a traditional financial institution. Additionally, many of these services have low account minimums – some as low as one dollar – making them wildly accessible although small accounts may not include some high-touch features. 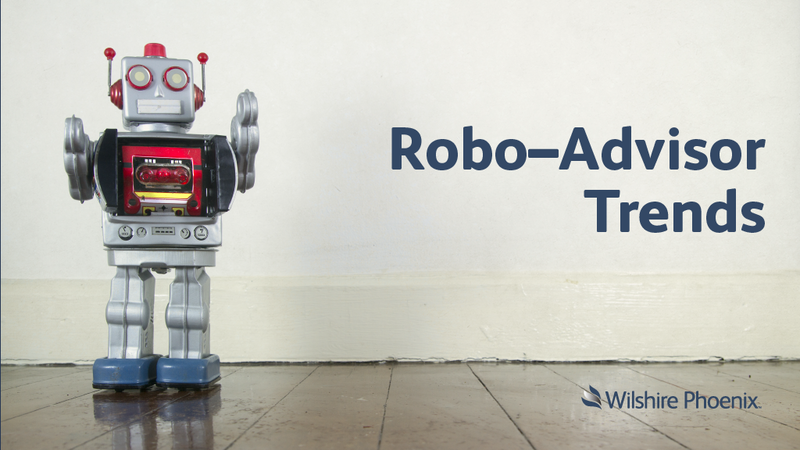 Methods of depositing cash into robo-advisory services are usually straightforward. One noteworthy method is the popular round-up which rounds up a users bank transactions to the nearest dollar and deposits the difference into an investment account. Indeed, this is an intelligent way to begin to grow wealth. The round-up deposit from a $3.51 cup of coffee can end up paying you back in full by the time you retire (assuming 40 years at 5% compounding). The robo model may pose risk to traditional wealth managers and likely increase the bottom line for custodians and fund issuers and administrators overall. Niche investing within the robo-advisor space is becoming an increasingly popular trend with services rendering portfolios that are themed towards specific sectors, such as tech-takeout targets, defense and those focusing on dividend yield. Multiple robo-advisors are rounding up user transactions to the nearest dollar and depositing the difference into Bitcoin and other digital assets, another prevalent investment opportunity for young people. The most significant opportunity within the robo-advisor space may be the integration of Socially Responsible Investing (SRI) and providing the architecture that allows users assign individual preferences to their portfolios. Bank of America has reported that SRI is a priority for at least half of millennials regardless of net-worth.3 Echoing Bank of America, Morgan Stanley reported that millennials are twice as likely to invest in companies or funds that target a specific social or environmental outcomes.4 As these services grow – more dynamic investment and corporate governance opportunities are arising that can streamline and eventually introduce an individual’s engagement in corporate America. 1. 2016 Wall Street Reputation Survey, Makovsky. 2. Asset Management 2020: A Brave New World, PwC. 3. 2013 U.S. Trust Insights On Wealth and Worth, U.S. Trust. 4. Sustainability Through the Eye of the Investor, Morgan Stanley. THE INFORMATION CONTAINED ON THIS WEBSITE IS NOT AND SHOULD NOT BE CONSTRUED AS INVESTMENT ADVICE AND DOES NOT PURPORT TO BE AND DOES NOT EXPRESS ANY OPINION AS TO THE PRICE AT WHICH THE SECURITIES OF ANY COMPANY MAY TRADE AT ANY TIME. THE INFORMATION AND OPINIONS PROVIDED HEREIN SHOULD NOT BE TAKEN AS SPECIFIC ADVICE ON THE MERITS OF ANY INVESTMENT DECISION. INVESTORS SHOULD MAKE THEIR OWN DECISIONS REGARDING THE PROSPECTS OF ANY COMPANY DISCUSSED HEREIN BASED ON SUCH INVESTORS’ OWN REVIEW OF PUBLICLY AVAILABLE INFORMATION AND SHOULD NOT RELY ON THE INFORMATION CONTAINED HEREIN. ANY EXAMPLES OF DISCRETE INVESTMENTS PRESENTED HEREIN SHOULD NOT BE CONSIDERED A RECOMMENDATION TO PURCHASE OR SELL ANY PARTICULAR SECURITY. THERE CAN BE NO ASSURANCE THAT ANY SECURITIES DISCUSSED HEREIN HAVE BEEN OR WILL BE HELD BY ANY CLIENT (“CLIENT”) OF WILSHIRE PHOENIX CAPITAL MANAGEMENT, LLC, OR IF SO HELD, THAT THEY WILL REMAIN IN THE PORTFOLIO OF ANY CLIENT, OR IF SOLD WILL NOT BE REPURCHASED. THE SECURITIES DISCUSSED ON THIS WEBSITE DO NOT REPRESENT THE ENTIRE PORTFOLIO OF ANY CLIENT AND IN THE AGGREGATE, MAY REPRESENT ONLY A SMALL PERCENTAGE OF ANY CLIENT’S PORTFOLIO HOLDINGS. IT SHOULD NOT BE ASSUMED THAT ANY OF THE SECURITIES DISCUSSED HEREIN HAVE BEEN OR WILL BE PROFITABLE, OR THAT EXAMPLES PRESENTED IN THE FUTURE WILL BE PROFITABLE OR WILL EQUAL THE INVESTMENT PERFORMANCE OF THE SECURITIES DISCUSSED HEREIN. NOTHING PRESENTED HEREIN SHALL CONSTITUTE AN OFFER TO SELL OR THE SOLICITATION OF ANY OFFER TO BUY AN INTEREST IN A CLIENT WHICH MAY ONLY BE MADE AT THE TIME A QUALIFIED OFFEREE RECEIVES A CONFIDENTIAL PRIVATE OFFERING MEMORANDUM, WHICH CONTAINS IMPORTANT INFORMATION (INCLUDING INVESTMENT OBJECTIVE, POLICIES, RISK FACTORS, FEES, TAX IMPLICATIONS AND RELEVANT QUALIFICATIONS), AND ONLY IN THOSE JURISDICTIONS WHERE PERMITTED BY LAW. NEITHER WILSHIRE PHOENIX CAPITAL MANAGEMENT, LLC, NOR ANY OF ITS AFFILIATES ACCEPTS ANY LIABILITY WHATSOEVER FOR ANY DIRECT OR CONSEQUENTIAL LOSS HOWSOEVER ARISING, DIRECTLY OR INDIRECTLY, FROM ANY USE OF THE INFORMATION CONTAINED HEREIN.